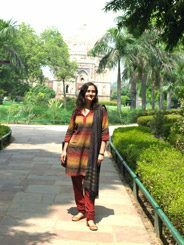 The Indian literary scene welcomes a new-comer: the German-Indian Saskya Jain. Admired by colleagues and critics alike, her debut novel ‘Fire Under Ash’ is set in Delhi. A walk with the author through an underwritten city. 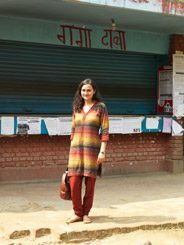 Two hearts beat at once in Saskya Jain´s bosom: As daughter of a German mother and an Indian father she unites two nationalities, two cultures and three languages – she speaks fluent English, German and Hindi. Homeland? Difficult to say. She was born in India, studied in Germany, and a couple of semesters in USA too. Her husband is German but her book is published in English. Saskya at home in Kaka Nagar | Photo: © Sarang Sena It is precisely this area of tension that Saskya inhabited since her earliest childhood, that shapes and inspires her, as her choice of the meeting place for us makes clear. 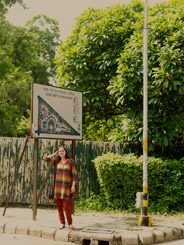 As a starting point for our excursion through the city, she suggests Kaka Nagar, a posh residential neighbourhood in Central Delhi for high-ranking civil servants. Separated from the main road by an ugly, two-meter high stone wall. ‘‘That was earlier not there’’, explains Jain. Neither was the bamboo-fence, which now protected the individuals in the grey housing block from curious glances. ‘‘At that time everything was open here. We could go about anywhere, knew every nook and cranny, every shortcut.’’ Today one has to look for a hole in the green fence to get a glimpse of the parental house of Saskya Jain. 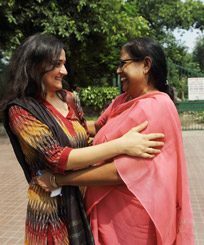 She was five when she moved with her parents and brother to Kaka Nagar, 18 when she left the colony for Germany. In between lay years of a well-protected middle class childhood in a well-guarded neighbourhood for the bureaucrats. The crazy thing is that her father was no bureaucrat. As an art historian and the director of the Craft Museum he got an apartment on the ground floor of Block D-II, right next to the Sports Club of the quarter. And unlike the neighbours who had to leave the house in cycles of 3-5 years, his family was allowed to stay on indefinitely: One of the many privileges that Saskya enjoyed in her life. But it was not always an advantage to the girl who will remain somewhat different. The older she grew, the more she grappled with her cultural identity and her socialization. ‘‘One is never completely this or completely that’’, she remarks. ‘‘Somehow one always takes on an outsider’s perspective. Perhaps, that’s the reason we become writers’’, she muses. And why is Delhi the focal point in both her novels? ‘‘My roots are in Delhi. I grew up here. I am proud of it. In that sense I can safely say, that’s where I belong’’, she declares without hesitating. And because she’s not a person who looks back poignantly, for whom nostalgia is not only dealing with the past but also with the future of her land, both her novels describe the current condition of the capital of India. In the Crafts Museum | Photo: © Sarang Sena A little poignancy, however, inevitably comes in as we reach our next destination: the Crafts Museum. Whether it is because Saskya Jain regularly spent the weekends here during her early years, or because the museum that her father had built so meticulously had lost some its former shine, we can only guess. Hearty meeting | Photo: © Sarang Sena Possibly it is because of the museum staff that suddenly appears from nowhere. They are visibly pleased to meet Saskya and hold her in their arms. ‘‘I see you still in your Papa’s arms, your knees wrapped tightly around him, with your favorite doll in your hands’’, says Renu Mathur emotionally. The former secretary of Saskya’s father has tears in her eyes. ‘‘And now a young, successful woman stands in front of me. I am so proud of her. I’ll certainly go to her book-reading’’, she promises. Hearty hug | Photo: © Sarang Sena This museum is a heaven for craft-lovers. Their collection is amazing and the area where the artists demonstrate their skills live is certainly worth seeing. One can enjoy a good couple of hours here in a relaxed atmosphere. With a shop and a nice café and not at all over-crowded, the museum is ideal for kids. No wonder that Saskya Jain is so attached to this place! 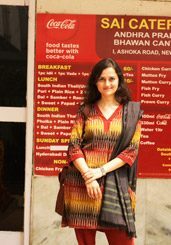 Andhra Pradesh Bhawan | Photo: © Sarang Sena The Andhra Bhavan canteen is, for her, a place not to be missed at any cost if you are visiting Delhi. These Bhavans are comparable to the German ‘Landesvertretungen’ which represent various states. The canteens in these Bhavans present the regional cuisine of the respective states – authentic, reasonably priced and delicious. Saskya im Lodi Garden | Photo: © Sarang Sena A welcome change for the senses is offered by the Lodi Gardens. The vast park area is one of Saskya’s favorite places in Delhi. Thus, we go there for a leisurely afternoon walk. Embedded in a high-end residential quarter, the gardens are a peaceful haven away from the chaos of the city. Saskya likes to spend time here to relax, on children’s birthdays and family picnics or simply to unwind. On tour with Saskya in the metro | Photo: © Sarang Sena From the green lungs we take a metro on the yellow line, headed south. And not just as a means of transport. 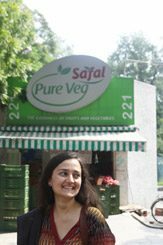 Saskya selects it as one of her special places in Delhi. ‘‘The metro is a recurring metaphor in my novel which stands for path-breaking changes, change of perspective and democratization.’’ What she means is that in a metropolitan city with 20 million people, where traffic is a great nuisance, metro has brought relief. ‘‘It is modern, clean, fast, safe and extremely punctual’’, says Jain, proudly displaying her Metro card at the counter. 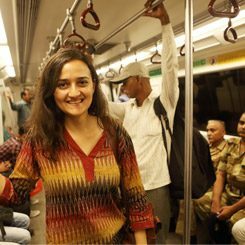 For women and Delhiites without cars especially, Delhi Metro is a blessing. In the metro | Photo: © Sarang Sena ‘‘Metro is a great equalizer: everyone from a banker to a cleaning woman uses it.’’ Also one of the protagonists in her novel experiences a change of perspective in the metro. This functions in one direction as well as in the other: When he drives on one of the main roads towards Gurgaon, Ashwin sees, for example, a row of boutiques and shops whereas the view out of the metro only shows rusty roofs. But shortly after, he is able to see the luxurious farmhouse of his parents from above. What was hidden from people on the street is now revealed by the metro. The first two coaches of each metro are reserved for women. They are pretty strict about the rule – we have to travel with our photographer in the third coach. Five Metro lines intersected by the sixth one connect the entire NCR (National Capital Region), which includes the prosperous suburbs Gurgaon and Noida. Moreover, further work to extend the network is under progress. Ganga Dhaba | Photo: © Sarang Sena Also our last stop is an example for Saskya’s original perspective. Our walk through Delhi ends at the campus of Jawaharlal Nehru University, popularly known as JNU. The state-funded university located in South Delhi is one of the most prestigious ones in India and a microcosm in itself. Replete with hostels, markets, an amphitheater as well as many ‘Chai-Wallahs’ (the typical tea-sellers) and ‘Maggi-Wallahs’ (Indians love the ready-to-eat Maggi noodles so much that they have special shops and kiosks for it). We want to have tea at the Ganga Dhaba, one of Delhi’s legendary tea restaurants, which attracts not only students, but also alumni and outsiders. Only the initiated know what is so special about this dusty, windy ramshackle revamped with a patch of stony blocks. It must have something to do with the intellectually charged atmosphere of the philosophical debates and discussions. The secret eludes me too. The ‘dhaba’ is closed for lunch until 4 pm.